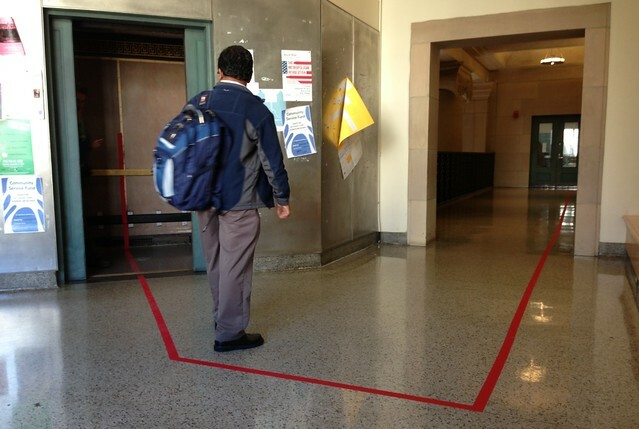 MIT Professor Annette Kim and her research group, SLAB (Sidewalk Lab) is hosting an exhibit called Sidewalk City: Mapping the Unmapped at MIT’s Wolk Gallery until November 15th, 2013. 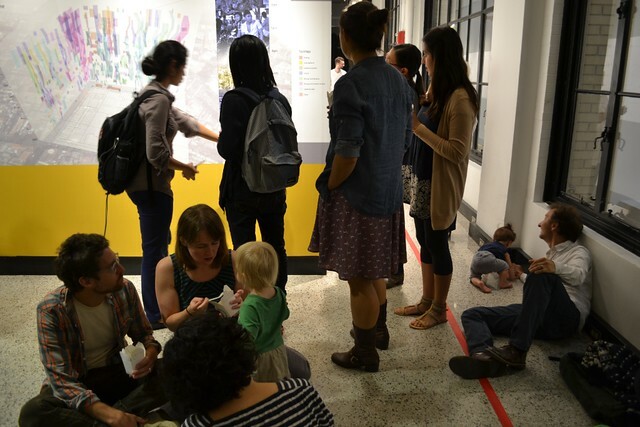 Q: Why did you and your group, MIT SLAB, put on an exhibition? A: Well, it was a labor of love because I love visual art. And it was also a chance to explore what we can do with maps in a physical space exhibition as opposed to virtual spaces on the internet or in a printed book. For one, we can do much larger scale and 3-dimensional maps — basically installations. The people viewing the map can use their whole bodies to read the map and use more of their senses. People squat on the typical Vietnamese stools as the images and sounds surround them. The exhibition is also research. And another thing the exhibition is studying is strategies in public engagement. 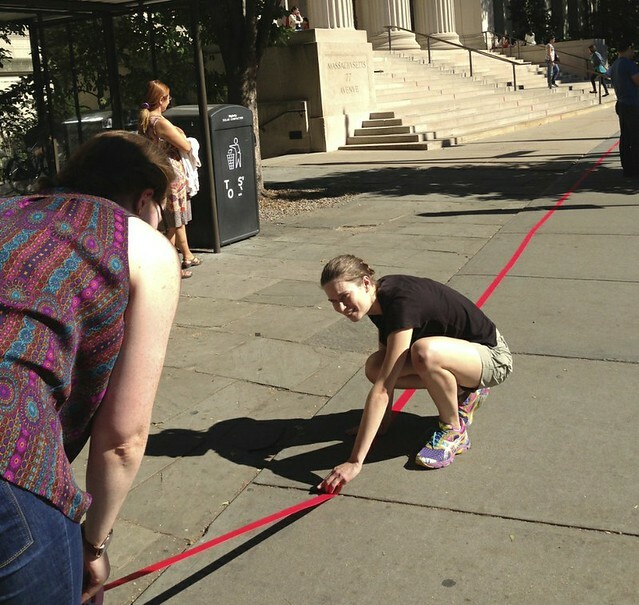 Since sidewalk life is the topic of the show, it would be ridiculous to remain cloistered deep within an MIT gallery. 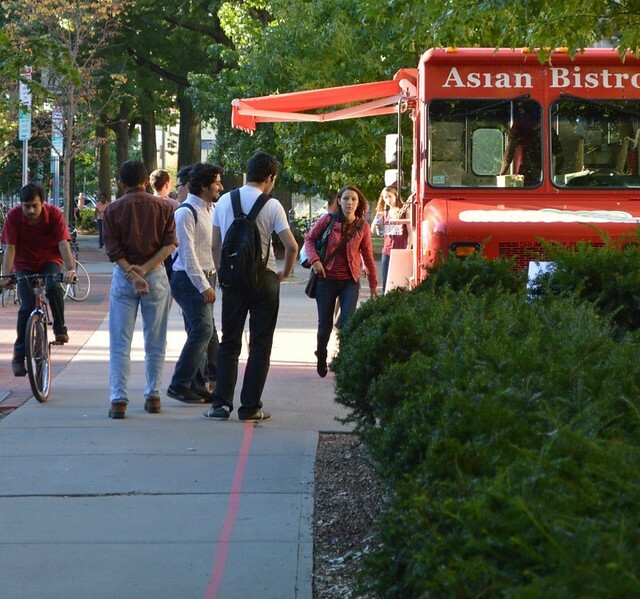 So that’s why for the opening reception we put Momogoose foodtruck out on Mass Ave. and taped a red line making a path from the truck to the Wolk gallery, through the lobby of Building 7, up the elevator, to through the door of the gallery. I was blown away by how powerful that line was. Even while we were putting it down people kept stopping us to ask where it led to. I kept running into people who felt compelled to follow it. People who had never been to Wolk came to the show, so to me it was a great success. Of course, Cambridge is an especially curious public, but that’s why that strategy fit this public. Q: What else surprised you? A: I loved how people I met at the reception were very curious and asking lots of questions and had trouble classifying what they were seeing. They would ask, “Are you the … scientist? the artist?” That ambiguous region is exactly where we wanted to be. There are different kinds of knowledge that are easier to tap into from the epistemology of art, but which can benefit science. A: Well, this is the first stop of a traveling exhibit. We will show in Ho Chi Minh City in January to see how art can contribute to public debates about sidewalk vendors. Then we’ll move on to Los Angeles, home to the largest Vietnamese ex-patriate community in the United States. For each place, we will explore a different strategy of engagement. This is part of a larger research agenda about understanding how critical cartography can adapt its strategies to different publics. And, I have decided to take an offer from the University of Southern California’s Price School to develop its spatial analysis lab, where I’ll expand the meaning of SLAB’s acronym. I will always be grateful to MIT, whose wonderful students and creative, free environment fostered its inception. Post by Annette Kim. 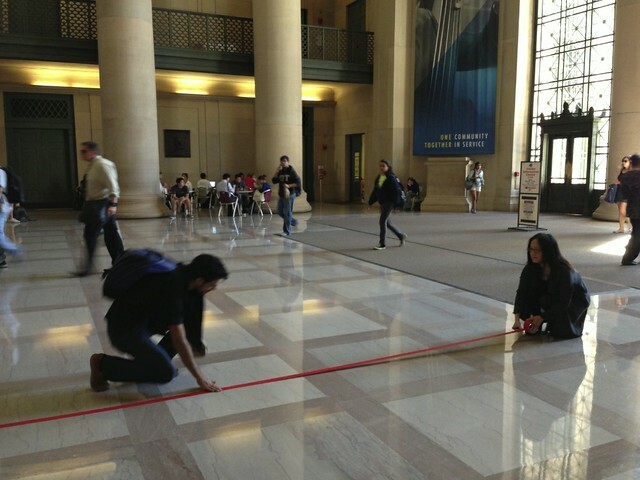 Photos courtesy of MIT SLAB.